These distinguished government, organisational and commercial clients have selected ISA Academy® as provider of professional security training to their personnel and/or consulting services for their executive boards. We feel honoured over the confidence our clients have given us throughout the years, and feel confident that our services have made a significant difference. The following are extracts from letters and comments we have received, they are all related to the ISA Academy's close protection training course. “ISA Academy’s close protection training is thorough and comprehensive. The teaching is aimed at adult humans with equal respect. What you put in, is what you get out. Coupled with superb instruction and instructor knowledge. Other courses may glorify and show close protection as a glamorous profession, ISA Academy shows the reality and gives the training to cope with that reality." "I found the course to be very professional, well organized and enjoyable. The instructors were extremely knowledgeable in their fields and with much life experience which shows in their teachings. 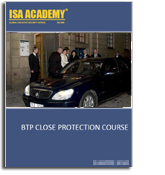 I would recommend this course to anyone wishing to enter the security or close protection profession!" "With my experience in security matters, concerning military and governmental dignitaries, I affirm that the effectiveness of the training, and the methods taught on the ISA Academy is fully comparable with the level of governmental and presidential security." "I have studied and worked as a police officer in NSW, Australia. After completing the BTP course I have a far greater knowledge of the subjects covered. In this short time with ISA Academy, I have learnt better and more practical ways to apply what I have learnt than I did in 1 year at the Police Academy!" “This course is something that every security officer should experience. The combination of real life experience combined of lessons make students active throughout the course!" “I expected it to be like any other ‘bodyguard course’, but at the ISA Academy the instructions were provided individually, emphasizing performance and pushing you far beyond your limits." "Working as a close protection officer for the past years I didn't think nothing much about it, until I turned up on the ISA Academy's course. It really was an eye opener, making you think for yourself and use your natural instincts, which is something all the other 'bodyguard courses' never do." "Mr Strands background in the close protection realm is second to none. I wouldn't hesitate a second to trust him with my life!" "Learning a lot on a short time. Professionalism and methods that are probably the best in the business!" "A very realistic course... I would recommend this course to anyone interested in learning professional close protection, or the security profession overall!" "This course far exceeded my expectations. I have greatly benefited and would recommend this to anyone considering close protection training." “The ISA Academy’s course is one of the most complete, professional and up to date courses I have seen." Copyright © ISA Academy® 2009. All rights reserved.